The first thing I noticed when I first landed in this country almost a decade ago is the richness in culture. Starting from the greetings, to the way children behave when in the presence of grownups, to the music, to the dresses made from Khangas and vitenges, etc. I found this place quite different from my homeland where culture is saved for events like the various community-based cultural nights with themes based on the culture of the particular tribe that would be hosting the event on that particular night. One of the things I noticed is the way people pass on messages using Khangas, which in most cases are disses or “mipasho” like they are commonly called here in Tanzania. As for those who can sing, their favorite mode of passing mipasho is songs, and specifically through taarab. At around the time I came in to the country, there was this taarab song by the late Mariam Hamis called “Paka Mapepe”. It still is one of my favorite songs todate, and every time I walk around, I see a lot of men who remind me of the “Paka Mapepe” being referred to in the song. Unless you really understand Kiswahili, it is very hard to understand the mipasho in some of these 12 – 16 minutes duration songs. Of course besides songs and khangas there are several other ways people pass on their “messages”, including blogs, Facebook, Twitter and other social media elements. The last place I expected to find these messages however, is on vehicles, especially those huge trucks that ferry sand and building materials. Then I saw some on a bajaji and another on a daladala! Yes, believe it or not Daladalas do have them too. For instance, there is one I saw a couple of days ago that said “Hata Mbuyu ulianza kama Mchicha”. Doing a direct translation, this simply means, “Even the Baobab tree started like some small vegetable”. Now if you know how big this tree can get, then you will understand what the person who said this meant. As I refer to the Mbuyu, my mind goes back to a conversation I was having recently with a very close friend of mine; well, I’d like to assume he is a close friend otherwise he wouldn’t have shared what he did with me. In his own words, he said he was feeling like God was “angry” with him because he felt he has not been achieving much in his life lately. According to him, everything he does seems to be hitting a snag. Every attempt he makes to be progressive in his life feels like it is useless because nothing positive has been coming out of it. As I listened to him rumbling about his “misgivings” the words on that Daladala kept coming back to me. The situation my friend was in is not unique to him. I have been down that road too where I feel nothing is working for me; not spiritually, not in my personal life and definitely not in my professional life. This feeling normally happens especially after a misunderstanding with my better half (yes I’m human too!) or after losing a big deal I was somehow convinced I would get., or after I have made a prayer request to God and He seems like He isn’t listening to me. It is very normal to feel discouraged. However, I have come to realize that we get overly anxious and impatient for nothing because whether or not we want to accept it, everything happens within the time it is supposed to happen. For instance, if you go to Nane Nane in Dodoma, you will most definitely find a lot of plants being showcased by various organizations and companies that deal with agricultural products. If you ask the persons concerned, they will tell you that most of those plants were planted several weeks back and have taken plenty of monitoring and tending to, for them to grow and reach the stage they are at now. Just like the Baobab tree that started like a veggie, or to put it in a better way a seedling, all plants have a process to go through before they can reach their mature age of bearing fruit/harvest; unless of course it is the beanstalk in the story of “Jack and the beanstalk”. That is the only time I know of a seed that was planted at night and in the morning it had grown into this huge forest. Similarly nothing in life happens overnight (unless it is a shoddy deal which is likely to land you into some serious trouble later). For instance, it takes nine months and a lot of drama for a child to grow in a woman’s womb and get born at the right time. Once the child is born, that is not the end of the story but the beginning in the sense that the child has to pass through a lot of phases before he/she can be termed to be mature. There is the crawling stage, the walking stage, the stage where he loses all his teeth, then he starts becoming a small terror, then a teenage terror, etc. As a parent, your place is at a mental hospital if you ever expected that as soon as your child is born he/she would start walking or talking. Only the animals that walk on fours are allowed to have this expectation. So why give up when other areas of your life do not work out within the time you want them to? Have you considered that they too, like everything else in life, have a cycle they follow, and that anything outside this cycle would be deemed un-natural? Even on a spiritual note, there is always a waiting period between the time you send a prayer request to God and the time He answers. It could be a minute, an hour, a day, a week, a month, a year, a decade, a century, etc. Whatever the case, there is always a waiting period for everything. So, the next time you find yourself bashing yourself and saying God is angry with you like my pal was saying, remember that everything has a process. 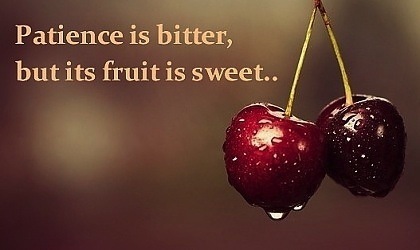 What you need to do is cultivate patience, and like Aristotle correctly said, “patience is bitter, but its fruit is sweet”. I would particularly want to address anyone who works within a sales environment. Unless you are selling fast moving consumable goods, or you are doing a Daladala business where you call out passengers to come to your bus, everything else needs time – even these need time too but the difference is that it is shorter than other business. Speaking from experience I will say this to you; every time you go out on a sales mission always think of it as a time to plant seeds that will eventually germinate into a plant that will in turn give you the required fruits. However, always remember that in between planting that seed and harvesting your fruits there is a lot of work to be done such as following up with your clients, giving them the necessary information and advice needed in order to make an informed decision, among other things. As for those in relationships, I cannot stress any harder that a relationship is indeed a seedling. For it to grow into that big wide baobab tree, you need to make sure you consistently and constantly tend to it by giving it the right ingredients. You also need to get rid of any kind of weeds that may come in form of spoilers e.g. extra-marital affairs, lack of transparency among other things. 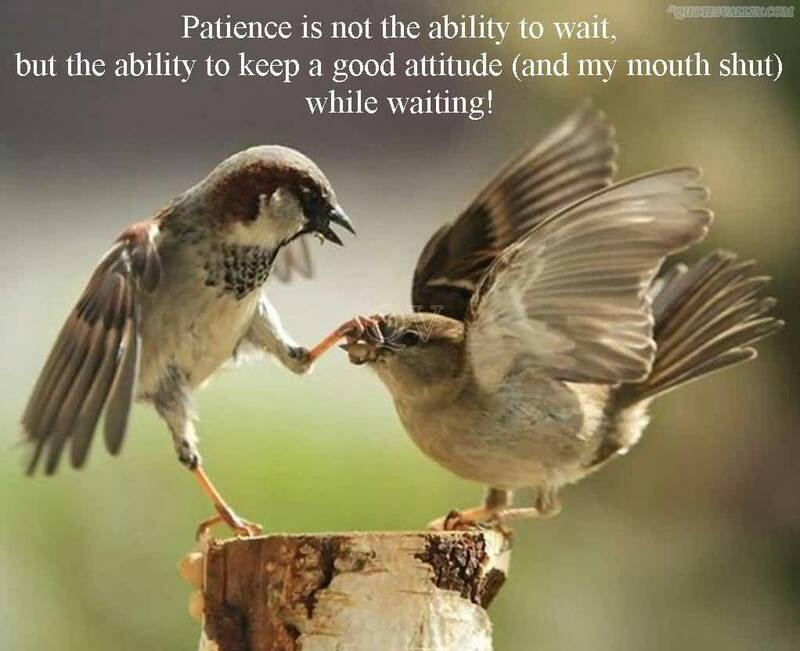 May you all cultivate the virtue of patience this week and every other week thereafter. PS: Article published in Tanzania's Guardian on Sunday on the 4th August, 2013, under my weekly column "Thoughts in Words"